Rarely has my professional work intersected so nicely with my personal history than in the forthcoming publication of a new book by Ervin Stutzman, Jacob’s Choice. The Jacob in this page turner of a book (to be published by MennoMedia/Herald Press, my employer) is my sixth-generation-back great grandfather and endured not only the violent death of his wife and two children, but was captured, along with two sons, by members of the tribe of Lenapi Native Americans. One of the older sons who was not captured was John, my five times great grandfather. He was already married and living away from the farm where the raid happened. my great grandfather, and Jacob’s triple great grandson. The novel is set in the Northkill area of eastern Pennsylvania, a fictionalized version of events because so much is not known, especially of the interior thought life of these my ancestors. Ervin has chosen to focus his look at this courageous peaceloving ancestor on Jacob’s decision to eventually seek reconciliation in the aftermath of the terrible tragedy that befell his family. Here’s a link to two free excerpts. And it is just the first of three books in a planned trilogy called the “Return to Northkill” series, which Ervin is still working on. Cousin Ervin (okay, its really shirttail, as momma always used to say about distant cousins, but still) has done much valuable research. He became something of a skilled historian and researcher in pulling together the fictionalized stories published earlier by Herald Press of his own mother and father in Emma and Tobias), so I greatly respect not only his work, but how he is able to get all this done on the side from his main job as Executive Director of Mennonite Church USA. My aunt Elnora, one of Uriah’s many daughters, was something of a writer and she always encouraged me, in my early writing days, to write about grandpa, her father, and four times great grandson of Jacob. (I don’t think it is mine to write, but I did blog briefly about Grandpa Miller here.) So I’m glad for this work by other distant cousins covering a much earlier period of family history and lore. There’s another book coming out, by another cousin, and I’m anxious to read that too. It is called simply Northkill, by J. M. Hochstetler and Bob Hostetler. Amazon says it is due out March 1. It will be interesting to read and compare the two books and approaches! If you are on Facebook and a relative you might enjoy hooking up with the “official” Facebook site for Hostetler/Hochstetler relatives, called Descendants of Jacob Hochstetler. The genealogical book of the same name was originally published by the same publisher in 1938 which was then called Mennonite Publishing House. There is a version of the genealogical book of the same name on Amazon, but I cannot vouch for its authenticity. 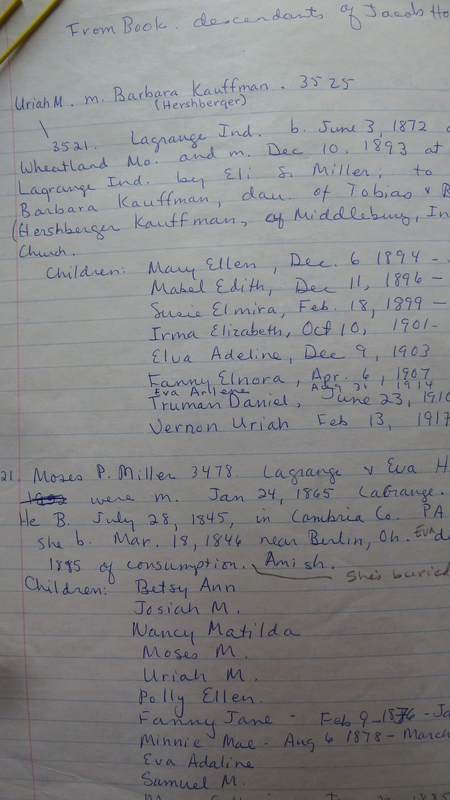 In the 70s when I was a student at Eastern Mennonite University, I first discovered the genealogy book in the Historical Library there and was so excited to find my father’s name written in it that I scribbled out all of the information pertaining to my lineage on notebook paper, (not being able to photocopy it). I still have those scribbles and I remember feeling such a powerful connection to my heritage. 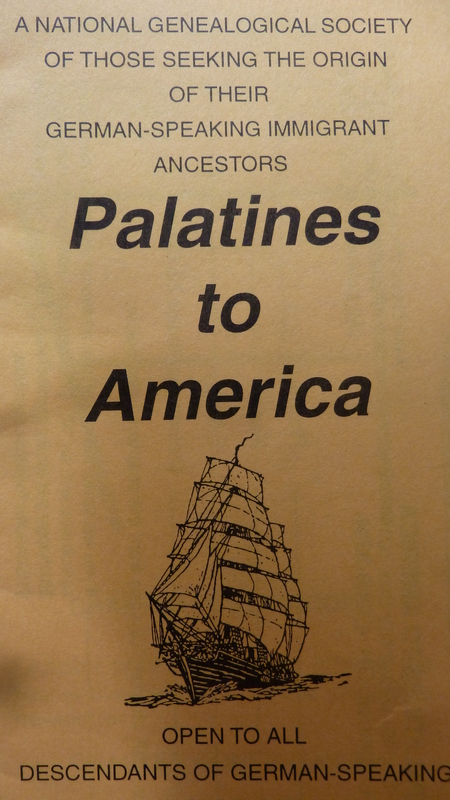 Another genealogical organization called Palatines to America has much material related to German speaking immigrants and ancestors from the Palatine area of Europe–which, interestingly enough, where my Lutheran-born husband’s relatives on his mother’s side, Hottingers and Sonifranks, hail from. 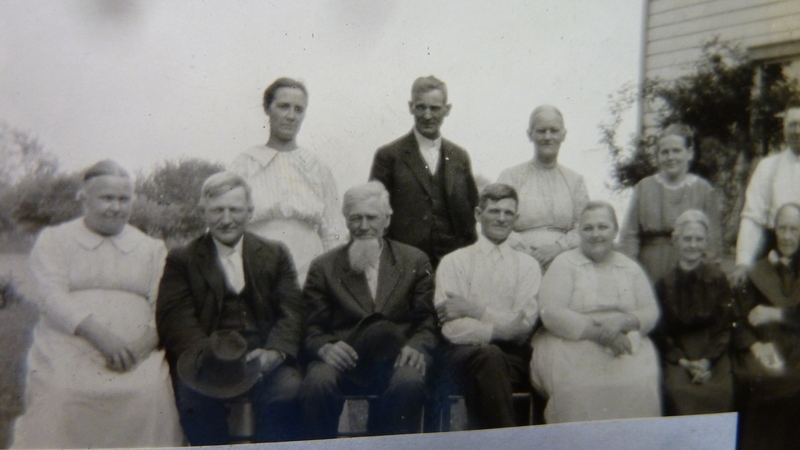 Moses P. Miller, my great grandfather near the middle with a long white beard; Uriah M. Miller right, my grandfather, short hair and plain white shirt (no coat); and Barbara Kauffman Miller, next to him, with long white dress. My father’s father was Uriah M. Miller (1872-1964). Uriah and his wife Barbara lived in our home and I was privileged to have them as live-in grandparents for the first 12 years of my life. Uriah’s father was Moses P. Miller (1845-1927), my great grandfather. Joseph Miller was the father of Moses, my great great grandfather. Anna Hochstetler, who married Abraham Miller, was the mother of Daniel (Anna and Abe combo is where I add my Miller family name): four greats. John Hochstetler was the father of Anna. (Five greats). John’s father was Jacob, my great, great, great, great, great, great (that’s six greats) grandfather. Jacob and his family were Amish of course and the best I can tell (including a notation in Descendants of Jacob Hochstetler) is that all of these forebears were Amish right through the time of my great grandfather Moses, and then the family began attending Forks Mennonite because it was close by. So my grandfather was never Amish but my great grandfather was for awhile. So, are you my cousin? Comment, like, or otherwise let me know! Yes, I’m a cousin, too. Thanks for posting. Hello from another “cousin”. I come from the line of John’s brother Joseph, one of the boys taken by the Indians. Hey, cousins. I know Doug, well! Betty, not as sure which Betty you are. Did you ever go to EMU? Long ago? Yes! I am a cousin as well. Love this tracing of your connections. Looks like your father is about my age. So where does the Chupp family live? Have you gone to any of the Hochstetler reunions? 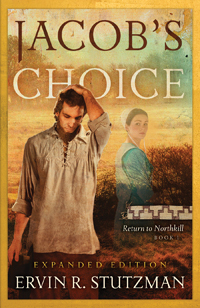 Have you read Jacob’s Choice yet?? I’m a bushel of questions here but thanks for commenting. Nice to meet you! Hello! Jacob Hochstetler was my 8th great grandfather. Hi Melody , your writings are so interesting!! yes we are cousins! Also a lot of good memories with you from Bethany High School!! My mother was Sarah (Schrock) Fisher, Her father Daniel Schrock , Daniel’s father was John Schrock , John Schrock’s parenst were Peter schrock and Lena (Johns) Schrock, Lena’s parents were John Johns and CatherineYoder , Catherines parents were Christian Yoder and Catherina Miller , Catharina Parents were Abraham Miller and Annelli Hochsteler, Annellis parents were john Hochsteler Catherine Hertzler , Johns father was Jacob Hochsteter also 6 great grandfather! !